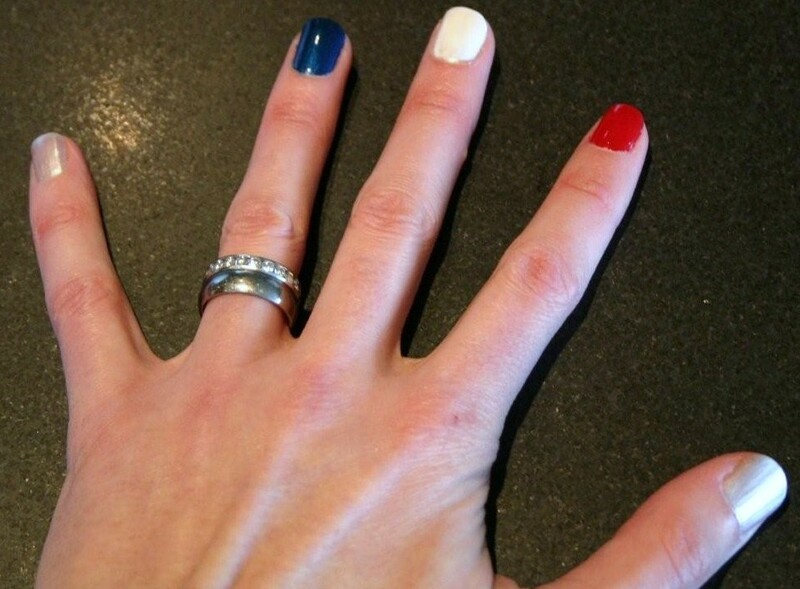 Just went to get a new Superbowl Manicure. Just about eight hours till kickoff of “The Big Game”. I’ve been a Pats fan for as long as I remember. I used to sit and watch games with my dad on every football Sunday. 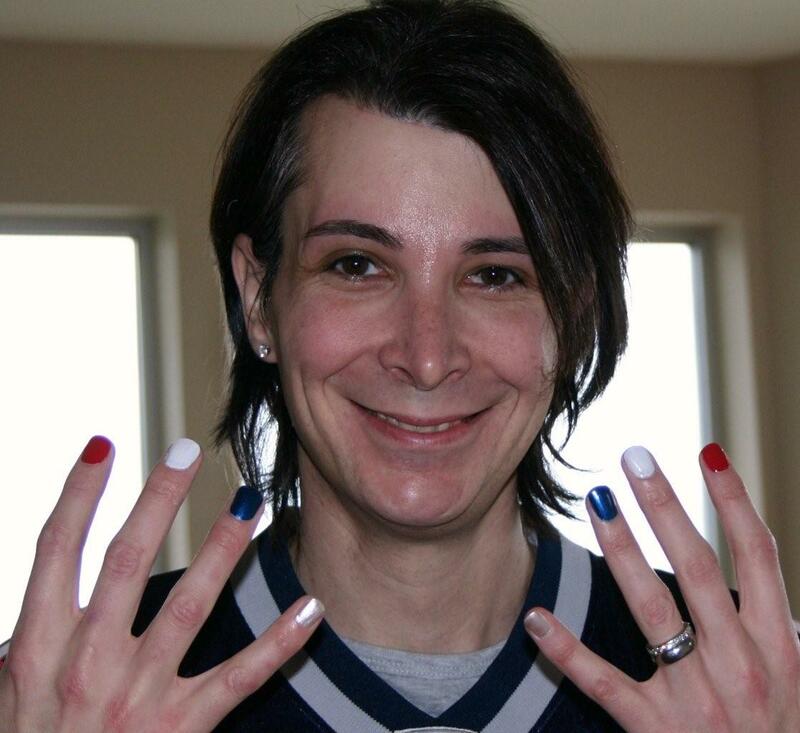 He would watch *any* football game, but he was a true blue Pats fan. He’d go make Onion Dip (which was McCormick Onion Soup Mix plus sour cream), and get a bag of Ruffles. Then, the piece de resistance, the Schlitz (later he upgraded to St. Pauli Girl, then Coors once you could get that in RI). This was during the 70’s and 80’s though – fundamentally then, the Pats sucked. In the words of my Dad, they “Snatched Defeat from the Jaws of Victory” on many occasions. They didn’t always sell out their games, so we ended up listening to a lot of games on the radio. We hated the Cowboys together, but sometimes rooted for the Redskins (we lived in Alexandria, Virginia for a while). I remember going to a couple of games with him in Foxboro – it was Schaefer Stadium then. It was a huge concrete bowl, with backless aluminum benches. We went to once game where the temp must have been 10F at most, and there was literally 2-3 inches of ice covering the seats. We went to another game in the pouring rain. We had crappy luck going to nice weather games. He was still alive (but not totally with it) for the Pats wins in 2001, 2003 and 2004, and he was so excited and into it. We used to talk on the phone for much of the really close games – just watching and reacting to it together. When the Pats played the Colts in the RCA dome in 2005, and ended up winning the game on a last minute goal line stand, I was in Florida driving to the aiport, and he was on the phone with me, doing play by play. He passed away in August of 2006. I know that my transition would have been hard on him, and I think about that a lot as well, especially on days like today, when he and I would have been so connected, and in it together. I hope he would have still loved cheering on the Pats with his youngest daughter. Anyway… in Brady we Trust. Notre Dame has “Touchdown Jesus“. The Patriots now have “Touchdown Samwich”. Here he is, post one of the three New England touchdowns today! For the record, since he was born, the Patriots have not lost, and the Red Sox won the World Series.